Last year, it was important to break the 13-season playoff drought. The Wolves won 47 games, which was an achievement. This year? Not so much. *Tom Thibodeau’s goodwill tour — and I say that seriously, not mockingly — has included recently a long sit-down with Star Tribune columnist Jim Souhan and an appearance Monday at the State Fair. In particular in that public setting at the Great Minnesota Get Together, Thibodeau revealed his mindset going into this season. Basically, it’s this: The Wolves need to win at a higher rate and achieve more than they did last year in order to keep their core intact. And the path to doing that is keeping Jimmy Butler, Andrew Wiggins and Karl-Anthony Towns healthy while hoping offseason additions help boost a woeful bench. “The winning will take care of that,” Thibs said at the Fair. *They win, say, 55 games, get a top-four seed in the Western Conference and win a playoff series — and they look energized in doing so. 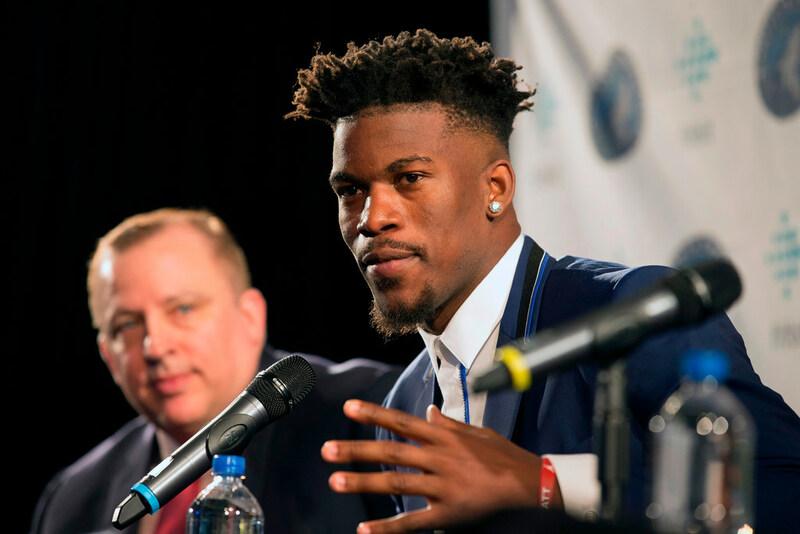 Butler, who can sign an extension with the Wolves for more money than any other team can give him next offseason, is convinced by the combination of cash and belief in the future that he should make Minnesota his long-term home. *They play at a pace pretty similar to last year’s and are on a trajectory to win around 45 games and grab one of the last playoff spots in the West, where they almost surely will lose again in the first round. *Everything falls apart, the energy is bad and by the midpoint of the season it’s clear that this train is going nowhere good. Outcome one is clearly the best-case scenario of the three. And for reasons Thibodeau outlined — the starters were actually quite good last year, and a rebuilt bench this year could help significantly — it’s plausible this happens. If the Wolves fall apart early, the decision is easy: Deal Butler and try to get as much back as possible from a team convinced that it would have an inside track on re-signing him. If the Wolves are hanging around the No. 7 or 8 seed in February, the decision is complicated: Keep pushing and hope for a strong finish and playoff run that sways Butler? Or risk a quick one-and-done (or missing the playoffs altogether) and possibly losing Butler for nothing? Last year, it was important to break the 13-season playoff drought. The Wolves won 47 games, which was an achievement. That exact same season this year, though, would be the worst-case scenario. The worry: Kirk Cousins won’t be as adept as Case Keenum at covering for a position of weakness. *Among the many Arizona sports figures slated to be part of the memorial service for John McCain is Minnesota native and longtime Cardinals WR Larry Fitzgerald.